The processor world is currently in an on-going battle between the powerhouse Intel, and its once inconceivable rival, AMD. Each company has a new generation of processors, Intel with the Pentium 4, and AMD with its Palamino. The first thing we need to understand is Intel's competition, as well as their other processors that are available. Currently the fastest processor (In terms of clock speed) from Intel is the 1.8GHz Pentium 4. AMD currently has the 1.4GHz Athlon. After reading that, you should have two questions in your head. One, if the 1.8 GHz chip is available, why are we reviewing the 1.7GHz chip? The answer to that question is quite simple, by the time we could finally get Intel to send us a Pentium 4 to review they only had a 1.7GHz chip available, even though we did ask for a 1.8. Not only that, but if you have ever read some of the other Pentium 4 reviews with pictures of the chip, you may have noticed that they say "Intel Confidential". This means that the processor is an engineering sample and the multiplier lock has been taken off, which isn't like that on a retail chip. Without a multiplier lock, it would have allowed us to overclock our sample, but unfortunately Intel didn't send us an engineering sample. Actually the D850GB motherboard, which Intel was nice enough to include didn't seem to have any options to change the FSB or voltage settings anyway. We hope that by the time this review is posted, Intel can set aside a 1.8GHz chip for us to take a look at, if that does happen, be sure to see a review on it soon afterwards. Also as a quick side note, according to Intel's roadmap, their 2GHz Pentium 4 is slated to be released sometime in Q4, most likely in September to be more specific. The second question you should be thinking is how come AMD has a chip that runs only 1.4GHz, while Intel has one at 1.8GHz…Wouldn't that make Intel a clear winner? Not necessarily, today clock speed doesn't guarantee a performance winner as there are a lot more aspects to what is faster. We will talk about some of the hard numbers and comparisons between the processors later in the review when we start getting into the benchmarks. Now that I have given you a bit of an introduction to the review and the background of where the processor world is currently at, lets start talking about the technology that goes behind the Pentium 4. 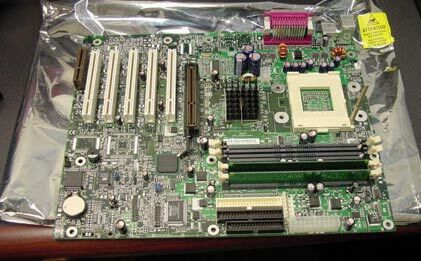 Since this is our first actual processor review, and specifically of the Pentium 4, we have published a separate in-depth article today on the technology itself. The article is written by Paul Mazzucco, our processor/technology editor. He is also helping me out with a couple aspects of this review. You can check out the article by clicking here. In case you really aren't interested in going in-depth with the Pentium 4, the next page is a brief overview of what the technology behind the chip offers. Hyper Pipelined - One of the secrets to a high-performing CPU is to pipeline the execution of instructions. While this increases latencies, and has other negative side-effects, it greatly increases the throughput of a processor, by allowing it to execute issue instructions every cycle. The Pentium 4 is, by Intel, considered to have "Hyper pipelined technology." The Pentium III and Athlon, by comparison are merely "Super pipelined." All this means is that the Pentium 4 breaks the execution of the instructions into smaller pieces, so as to allow the processor to reach higher clockspeeds. Better Branch Prediction - The longer the pipeline, the more it hurts when dealing with branches in code, because the penalty for guessing wrong is greater. On the Pentium III, the Branch Prediction Unit had an efficiency of about 90-91%. Because the Pentium 4 has a pipeline length that is twice that of the Pentium III (even more if there is a Trace Cache miss), the penalty for guessing wrong in branches is greater than on the Pentium III. To help combat this, Intel improved the Branch Prediction Unit of the Pentium 4 over that of the Pentium III. Rapid Execution Engine - The "Arithmetic Logic Units" (ALU) run at twice the base clock speed of the processor. This means that a 1.7ghz Pentium 4, which has two double-pumped ALUs, running at 3.4ghz! The most basic, and most used instructions, add, subtract (which is mathematically addition), Logical AND, and Logical OR, can be completed in one ALU cycle, which means that they complete in the time of one-half the base frequency. Trace Cache - The Trace Cache, as implemented in the Pentium 4, has a storage capacity of approximately 12,000 micro-ops (RISC-ish instructions that are simpler to execute, and of uniform length, unlike x86 instructions). This has the benefit of lowering the branch penalty that the Pentium 4 would otherwise have, due to the fact that in the case of a Trace Cache hit, the instruction doesn't have to be decoded all over again. The other major benefit is that code is stored contiguously in the order that it was executed. Quad Pumped FSB (100mhz, 400megatransfers) - The Pentium 4 has bandwidth like no other x86 CPU. A major reason for the massive bandwidth is due to the fact that the Pentium 4 has a quad pumped front side bus. Though it's not as good as a real 400mhz FSB (the latencies aren't as low as a theoretical 400mhz FSB), a quad pumped FSB provides 3.2Gigabytes per second of bandwidth. When paired with 2 channels of PC800, main memory matches perfectly with the bandwidth of FSB, unlike the Pentium 3 and the i840 chipset, which has the same theoretical main memory bandwidth, but is bottlenecked by a much slower, 1Gigabyte per second front side bus. Advanced Transfer Cache - As stated above Intel's Pentium 4 is a bandwidth hog. As such, Intel opted to beef up the L2 cache even beyond that of the remarkable "Advanced Transfer Cache" used in the Pentium III (256Kb, 256-bit wide, 8-way associative, non-and blocking - for more info, see http://www.systemlogic.net/articles/00/10/cache ). The Pentium III's Advanced Transfer cache was 256bits wide, but could only transfer data every other cycle. The Advanced Transfer Cache of the Pentium 4 transfers data every cycle, thus providing twice the bandwidth per clock cycle over the Pentium III, resulting in a whopping 54Gigabytes per second of bandwidth to the core when at 1.7ghz. Even if a Pentium III managed to get up to 1.7ghz (which would be unbelievably difficult), it would only manage about 27Gigabytes per second of bandwidth from the L2 cache. 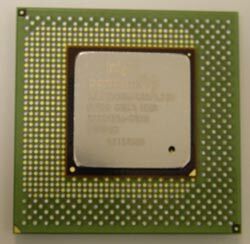 Hardware Prefetcher - Part of the reason why the Pentium 4 needs such huge amounts of main memory bandwidth is due to the fact that it implements a hardware-based prefetcher. The Pentium III introduced integer instructions that allowed a programmer to call instructions into a cache before it is actually needed. The only downside of this method is that it requires software support, which isn't always easy to come by, and it also can introduce slight code-bloat. The hardware prefetcher requires no such software support, and automatically fetches some instructions before they are needed. This uses bandwidth, and if there isn't enough, can actually cause main-memory bandwidth contention. The massive main memory bandwidth afforded by the Quad Pumped FSB allows the hardware prefetcher to basically "trade" excess bandwidth for lower average latencies. iSSE2 - Similar in concept to MMX, 3dNow! and iSSE, iSSE2 is a SIMD technology. This means that if the same operation needs to be performed on multiple data elements, with SIMD, only one instruction is needed. The difference here is that iSSE2 provides double-precision floating point and 64-bit integer SIMD, using 8 new, 128-bit wide registers specifically for the technology. It, like its predecessor, is also fully IEEE compliant (meaning you get the results that one should expect according to a universal standard), while 3dNow! is not fully IEEE compliant (meaning the results from using 3dNow floating point operations can be ever-so slightly off). Thermal protection - The Pentium 4 has an internal thermal diode which will throttle back the CPU if it gets exceedingly hot (such as if the fan dies on the heatsink). This protects the CPU from overheating as a Thunderbird Athlon would. Also, if the temperature exceeds 135 degrees Celsius, the CPU will shut itself down, so that it won't burn out. The Palomino core has a thermal diode as well, so future Athlons shouldn't have the same growing pains that the Thunderbird. Before presenting the benchmarks, there is one issue that needs to be discussed. We had some issues getting some comparable processors in the labs, as mentioned before, this is SystemLogic.net's first processor review. In our benchmarks we only used the P4 1.7GHz and a 1.1GHz AMD Athlon (200MHz FSB). We will be forced to recommend you a few other sites benchmarks for some comparison, but make sure to keep our numbers on the Pentium 4 in mind. We will also be referring to various sites benchmarks as well. In our next processor review there should be no problems in terms of having a few comparable processors available. Another issue that came up had to do with 3D performance in Windows 2000. The tests that were run on any 3D performance benchmark (Eg: Quake III, Aquakmark, 3DMark) all scored very low numbers. In fact, Aquamark kept on freezing on us. Since the issue showed in just 3D performance, the first thought that comes into mind is that it is an issue with the video card, which happened to be a Visiontek GeForce 3. We contacted Intel right away and sent over the numbers. Intel's performance engineers went over them and stated that they were getting the same sort of results over there as well, and that it was mainly because of Windows 2000's lack of gaming support. They were using a GeForce 2 in their tests with an older driver version, and said that the GeForce 2 would perform better than the GeForce 3. I thought this was a bit of an odd conclusion, considering the fact that we looked on some other sites benchmarks for 3D performance in Win2k, and their numbers seemed fine. Just to make sure, we threw a GeForce 2 into the system, and still had the same results, so we're not sure if it was a video card driver issue, a motherboard issue, or what, but we decided not to post 3D performance results in Windows 2000 until we found out. Each system had a formatted hard drive with clean installs of Windows 2000 Proffesional SP2 and Windows Millenium Edition in a dual boot format. All necessary updates to the operating system were made VIA Windows Update. Each benchmark was installed, run, and uninstalled. After each uninstallation the drive was defragmented, and the next benchmarking program was installed. For Quake III Arena benchmarks, we used Q3Bench to automate things. SYSmark 2001 has "real-world" usage built into it. It uses scripts and timing delays to perform the tasks similar to how a real person would, performing tasks a real person would do. MS Word2k - Opens a document, adds some graphics, text, backgrounds, and prints. MS Excel2k - Sorts data, and creates charts. MS PowerPoint2k - Makes a presentation, formats, previews the slides as they go along, and adds a background. MS Access2k - Loads the database and reorganizes material, processes information, and opens/prints the results. *Netscape 6.0 - Opens a web-file, does a word search, views the source code, then views a web-based power point presentation. Dragons NaturallySpeaking Preferredv.5 - Transcribes a *.wav file in the background. WinZip 8.0 - compresses some videos in the background. McAfee VirusScan 5.13 - Scanning files in the background. * While this is a personal opinion, and while I certainly support competition, there is no good reason to use Netscape 6.0 instead of MS Internet Explorer (5.0 or greater). While Netscape is still prevalent, it has nowhere near the installed user base as Internet Explorer, and it is well known that Internet Explorer is faster to load, and faster to use. I see no good reason why Netscape 6.0 was chosen over the MS version, as they used MS products for everything else in this part of the test. In my humble opinion, it would make sense to include Internet Explorer into this group (perhaps in addition to Netscape 6.0), simply because it is the more-used browser. Adobe Photoshop 6.0 - Opens a large picture, does sample filters, tests resizing/orientation, adds other effects and resaves as a jpeg, and prints. Adobe Premier 6.0 - Makes a video, adding effects and is then compressed. Macromedia Flas0h 5 - The user creates a movie file. MS Media Encoder 7 - Takes a video and encodes in the background. Video/Resolution: Creative Labs GeForce Annihilator 2 with 32 MB DDR onboard memory, 1024x768 resolution, 16 bpp color, 75 Hz monitor resolution. Disk: 30 GB ATA 100 IBM DPTA-373420. As a "Power user" myself, some of the descriptions above sound realistic for someone who knows how to get the most out of their machine in terms of multi-tasking to get as much done in as short a time as possible. However, the average corporate user does little more than type up some reports, browse the web, or check email. The majority of PC users do not do many of these tasks simultaneously (some, they wouldn't do at all). However, as people become more computer literate, the described workloads become more realistic. Despite this, there are users who fit the profile given above. In such cases, the aforementioned usage stresses the memory subsystem more heavily than running only one program at a time, due to the number of applications running in the background, and due to the user switching between programs. As an example, doing such causes the L1 and L2 cache to change their contents much more frequently than running one applications at a time, stressing both memory latencies, and bandwidth (as well as, of course, the CPU itself). We can see here that Windows 2000 performs better on both processors, this generally occurs in most of the benchmarks that we ran. In Win2k there's about a 35% improvement in over the 1.1GHz Athlon. Make sure to take in mind that the Athlon is using a 200MHz FSB rather than a 266MHz FSB. Not only that but the memory is PC133 SDRAM rather than DDR, which can improve performance by sometimes as much as 15%. On other sites benchmarks there is about a 10% speed difference between the P4 and a 1.4GHz Athlon. That's a pretty big difference, and Intel is usually known to do pretty good with multimedia type applications over business type applications, where AMD usually does better. Here we can see what I mean by AMD processors usually doing better in office type applications. The gap between the two processors is about 12%, over a previous gap of 35%, that should prove a lot. Taking a look at some other sites benchmarks for other processors scores, the Athlon 1.4GHz tears the Pentium 4 apart. In fact, even lower speed Athlons like the 1.2GHz come very close to the Pentium 4 1.7GHz. Now we know that each processor has it's strong points in certain types of applications, but overall the Pentium 4 came out on top, but not by much. Actually, taking a look at some other sites scores and averaging them out, the Pentium 4 only edged out by less than 5% in some cases. In the introduction, I mentioned clock speed isn't everything anymore, here's the proof. Quake 3 has been one of the staple benchmarks of review sites since the games inception. While it is getting a bit on the old side, there are other games which use its engine, such as American Magees "Alice," and Star Trek: Elite Forces. While benchmarking all the games would be best, sometimes triage must be performed with respect to a reviewer's time. So we've stuck with the tried and true Quake 3 to be representative of OpenGL performance, and the other great bonus is that it's popular, and many scores to compare with elsewhere. Quake 3 also has the distinction of having the ability to change visual complexity by increasing the number of polygons that are rendered in a scene. It also has multithreaded support, though it is somewhat limited. While we didn't test the former simply because no hardly anyone (at least that I know of) uses it, the latter due to lack of a dual P4 platform, this bandwidth intensive game is also greatly affected by the speed of the processor, especially in the lower resolutions in the same way that the 3dmark tests were. Quake III Arena is one of the tests that we usually see Intel perform really well in. As you can see from the charts, the Pentium 4 performs almost twice as fast at the lower resolutions. Note, that the lower resolutions are more important as they tend to use more processing power, rather than the video card. The higher the resolution, the more dependant on the video card it is. Other sites tests aren't really setup nearly the same way ours was, but you can see that the Pentium 4 really just pulls away here. While 3dmark2001 is based off of a very current game engine (Max Payne reviews have already started popping up), Aquamark is a benchmark of an actual game: Aquanox. Aquanox is a DX8 game, and has extremely advanced visual features. This might lead one to believe that it should be totally video-card bound - other sites (Example here) have shown that only a GF3 can make use of its T&L engine for this demo. If this is indicative of the real game, then, on systems without a GF3, the CPU itself will limit the gaming performance. This should lead one to believe that, though the game is indeed very much graphics-card bound, even if the system has a GF3, performance should improve considerably with a faster CPU. Our results below indicate this as well. Since AquaMark is a DirectX 8 application, it does use a lot of the GeForce's 3 power over the processors, although we left the pixel shader off so that it would not depend on the video card as much. The Pentium keeps a 30% - 35% lead here, but when looking at other sites, the Athlon totally wrecks the Pentium 4. Even a 1.2GHz does better, and the use off DDR memory helps the Athlon substantially. The one thing we do notice is that the numbers overall aren't very gapped throughout a lot of the clock speeds, which just shows that the video card is really doing a lot of the performing. There are a few points that need to be touched on to put everything into perspective. Intel has a great chip here that performs relatively well. At higher frequencies, the Pentium 4's performance is able to distinguish itself from Intel's previous archtecture, and can easily outperform the lower end Athlons. AMD's 1.4GHz processor performs close as well, sometimes performing better than a 1.7ghz Pentium 4, sometimes slower, as other sites have shown. Note that AMD will release faster clock speeds by the end of 2001 which may close any gap that we see right now. On the other hand, Intel should be moving to 2GHz with the Pentium 4, so we'll have to see what kind of numbers each of those higher-end this generation chip boasts. The main concern with the Pentium 4 is its price comparison to an almost as fast Athlon. Is it worth twice as much money? At this time, we can honestly say no, but there are a few paths. First of all, even though the Athlon may cost cheaper and perform better, there will a huge percentage of people, whether they are home users or corporate users, that will stick to Intel because of the name. For corporate users, even if you personally believe that the Athlon route is the way to go, your boss may want solely Intel products. In that case, in terms of performance the Pentium 4 is a great buy over an older Pentium III. Looking at it this way, the Pentium 4 is very much exceeding the performance of their highest performing .18 micron Pentium III's. If you must stick with an Intel chip for performance, there's no reason to choose a .18 micron Pentium III over a Pentium 4. For the rest of you, our best recommendation is to wait until Northwood and Palamino come out. With the Northwood Pentium 4 there are a few things that will make a big difference from the current Pentium 4. The main thing is that, like all new architectures, the comparatively large Pentium 4 is itching for a smaller process. This means that it should scale in frequency much better in .13 compared to the Pentium III than it did on .18, and thus, scale better in terms of absolute performance. This means that the Northwood should perform a lot better. Not only this but there will be no needed for a new enclosure (although you still need a new power supply). Also, it will be socket-478 rather than the current socket-423, which is planned to die out. The Northwood should also be cheaper to make, so the price savings go directly to the users, so prices should be lower. For the final words, the chip is great, although right now the costs are just too high compared to the Athlon, and it makes sense to wait a little while longer for either Northwood or Palamino.